This is learning made easy. Get more done quickly with Office 2016. Jump in wherever you need answers - brisk lessons and colorful screenshots show you exactly what to do, step by step. Joan Lambert has worked closely with Microsoft technologies since 1986, and in the training and certification industry since 1997. As President and CEO of Online Training Solutions, Inc. (OTSI), Joan guides the translation of technical information and requirements into useful, relevant, and measurable resources for people who are seeking certification of their computer skills or who simply want to get things done efficiently. Joan is the author or coauthor of more than three dozen books about Windows and Office (for Windows, Mac, and iPad), video-based training courses about SharePoint and OneNote, and three generations of Microsoft Office Specialist certification study guides. Joan is a Microsoft Certified Professional, Microsoft Certified Trainer, Microsoft Office Specialist Master (for all Office versions since Office 2007), Microsoft Certified Technology Specialist (for Windows and Windows Server), Microsoft Certified Technology Associate (for Windows), and Microsoft Dynamics Specialist. Joan currently lives in a small town in Texas with her simply divine daughter, Trinity, and an ever-growing menagerie of dogs, cats, and fish. 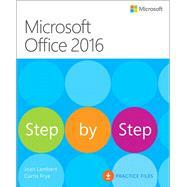 Curtis Frye is the author of more than 30 books, including Microsoft Excel 2013 Step by Step for Microsoft Press and Brilliant Excel VBA Programming for Pearson, UK. He has also created and recorded more than three dozen courses for lynda.com, including Excel for Mac 2016 Essential Training and Excel 2013: PivotTables in Depth. In addition to his work as a writer, Curt is a popular conference speaker and performer, both as a solo presenter and as part of the Portland, Oregon ComedySportz improvisational comedy troupe. He lives in Portland with his wife and three cats. Table of Contents from 2013 version.